Shouldn’t consumers know where their money is going to? Are you laughing with me now? No… Ok. Yes, more people need to talk about this. The market pricing for consumers and going market value for appraisal services is distorted by unregulated fee raking. In other sections of real estate this would be recognized as a junk or unearned fee. When cost savings are achieved by way of a discounted appraisal fee, but that saving is not returned to the consumer, and rather is held as profit by the distributor, this is quite similar to a bribe to be the preferred selectee. These distributors have turned into professional advocates for lenders interests with hardly any regulatory restriction or licensing accountability. There was far more accountability and professionalism when a licensed mortgage banker or a lenders underwriter could speak to the appraiser, and we would appeal to each other for work, coverage, and problem management solutions. One thing is for certain when dealing with unlicensed unaccountable middle men whom distribute orders, the appraiser either plays ball or is deemed replaceable on a moments notice. There is far less professionalism in distribution these days, given the consistent lack of experience and absence of licensing in the persons whom now distribute appraisal orders. Distribution is an entry level job these days. The persons whom advocate for lenders and pressure appraisers the most are the ones whom get promoted. If they all were required to have appraisers licenses, the majority of their behavior would be deemed so unethical, they would lose their licenses. Example # 4… driveby request from Corelogic, another scum amc. Driveby total $420 while appraiser gets only $184. I’d be more interested to learn the name of the idiot whom that order was assigned to. Clearly they have colluded with the lender or middle management company to defraud the home borrower. Was that you, how did you come across this information? No not me. My minimum fee is $600 and most of my work is private. I don’t leave the office for less than $600 and I don’t need to prostitute myself like some! This has been an issue for years and it is a contributory factor to the diminishing number of appraisers willing to work for less than customary and reasonable fees. Why would anyone want to work in a profession that treats appraisers so poorly? Over the years I have been fortunate to weed out the bottom feeding clients, but I do understand that others are not as fortunate. However, I still do not know how appraisers can run a business being paid these fees. The only way I know to get this message out is through REALTORS, who interact with buyers and sellers daily. Almost like a “how to prep your client for the Appraisal”, who is coming, why, how much $. They could be our allies, even though we degrade them daily, do to the disparity of required education, qualifications and testing, they would get the word out to the ONLY PEOPLE who care, the BUYERS & SELLERS. The general public could care less about this, they are not involved in the process and 35-40% will never be (2017 Home Ownership Rates). What about homeowners who refinance? They don’t use REALTORS! Further more and more purchases are not going through REALTORS. Lets not forget the at times additional fees appraisers must pay out of pocket AFTER the split. 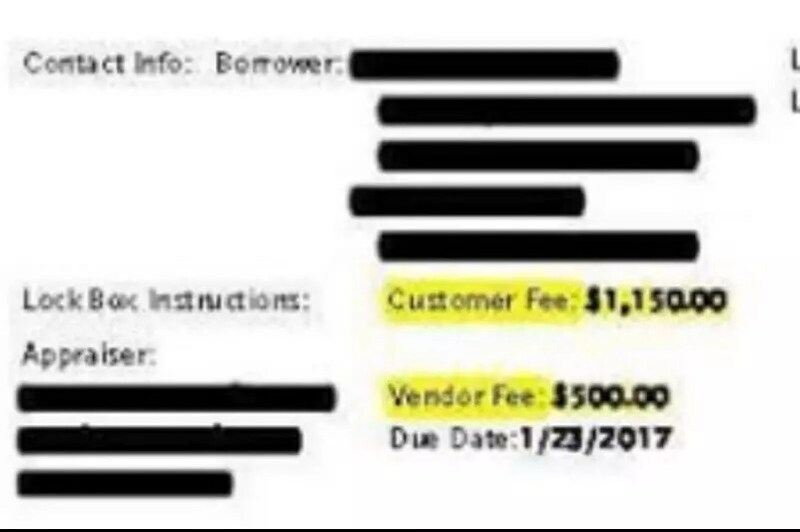 A former client of mine via Appraisalport started charging appraisers $28 for deliver/technology fees per full report, while another one (get this), started deducting from THE APPRAISER a 2.35% convenience fee in case THE BORROWER paid the lender via a credit or debit card (processing fee). They’re charging these fees on both ends most likely. There is one acceptable payment method; A check in the mail. There is one acceptable fee, my stated fee. End of story. They’re all jokers whom advocate against appraisers and advocate for lenders, mercury, ap, lenderx, scope, all of them. They all provide lender side users more tools which could easily be supplied to appraisers, but they give appraisers notably less functional access and control. I think I need to make a run to the liquor store now. Even our own government doesn’t know the truth, or ignores the truth when it comes to net appraisal pay after AMC involvement. In part, the reasoning behind the issuance of appraisal waivers by Fannie & Freddie was as they said “to reduce costs to the consumer / $500 appraisal fee”. Does it matter when by volume 80% of all residential appraisal orders get filtered through AMC’s where they collect 20 to 50% of that $500? The spreading of the truth must always be the goal, as only when all have the knowledge can we judge those who ignore the injustice of others. Two groups have stepped up and fully illustrated to appraisers on the national news what IS POSSIBLE. Appraisers appear to be incapable of grasping the concept however. Two weeks ago students marched on Washington and brought their concerns to the nation on EVERY NATIONAL NETWORK for a full weekend. Yesterday Kentucky & Oklahoma teachers abandoned their jobs to march over unbelievably deceptive legislation. They made the top story on NBC news and were mentioned on every network as one of their top stories. Why is it that appraisers are unable to grasp this concept? They’ll spend hundreds if not thousands of hours belly aching over their poor miserable lives yet they keep accepting the work and REFUSE TO ORGANIZE AND BOYCOTT AMCS? They’ve had 9 long years to figure it out already yet they just can’t find the simple solution to saving their “profession”. I leave you with one question: Why should consumers trust such a group to value their largest investment? Horrible analogy. Because unlike those groups whom seek to erode constitutional protection, we are more strongly focused on protecting rights and fair dealings. Constitutional rights are inexorably tied to private property. No, I don’t think we need another activist campaign. We need to enforce the rules and regulations which are already in place. We need to stop the unfair advantage granted to these lenders in the form of ‘separation from loan production’, and get back to letting the free market manage these issues. Nobody would work this hard to drive down appraisal fees if the cost savings were returned to the borrowing consumers. Cost savings are held as a profit point to promote monopolization of this industry by outsourcers and middle management interests. The discarded HUD1 disclosure form with clear separation of appraisER and appraisAL management fees is still an option. Improper co mingling of the appraisers fees with people other than the appraiser, with no clear or nationally consistent disclosure rules, continues to be the backbone of all this billing and assignment fraud. These bert and ernie outsourcing groups and appraisers whom brag about using them, would have never took off if there was not so much deception in billing and billing disclosure. Good Article Mark, but why are you posting this for appraisers to read. Why not send it as a letter to the editor of the newspaper? A Press Release to television stations? We have got to stop preaching to each other and start educating the consumers. It’s like the dog chasing its own tail. Perspective my dear advocate, perspective. This site is unusual, it has thousands of regular readers, but few posters. Don’t let the oftentimes slow blog roll fool you, thousands of people read each and every article, sometimes more. I talked with admin about putting up one of those globes with pins icons which track hits and such, but she says it slows the page load down too much. The reason the most important topics need to be posted here, there is no ability for these major corporations to engage in content control, which they certainly would do for either the article, or reader responses, or both, if posted in a more ‘mainstream venue’. I counter your request to post the article elsewhere with a request for you to link this article elsewhere and bring more readers here instead. I can not disagree with you because you are correct in the readership of this blog. I frequently share and point others here. But why not take advantage of all avenues? I have to remain optimistic that not every publication censors content or revolves around advertising dollars. This profession certainly has our share of them though. Education does not happen over night and each of on this blog and in the profession need to do our part and share, educate and support. State Coalitions and the Network are all working on changing the direction of the conversations. It is an uphill battle at this point, but some are listening so we must continue to move forward. If you trust ‘big media’ these days, you’re clearly living in a time capsule. No, such faith is misplaced. Companies now routinely hire people to scour the net and identify any and all points of both negative publicity and opposing view points, they remove that content by any means possible. If media was functioning as a check to power like it should have been, we would not be where we are now. Their failure is the exact reason sites like this have sprang up. The editors of the ‘papers’ appear to be too busy advocating against constitutional rights, they probably don’t have time to oppose major corporations at the moment. They were literally all co opted or crushed. Be careful where you source your ‘news’ from these days. Some appraisers, who shall remain nameless, still support the AMC model as long as they are good A, and B clients. Many also live in a bubble, and seem to think just because what is reality for them (higher fees), that it must be reality for all. There are many appraisers who still don’t understand our industry from a big picture point of view. Bill unless Congress gets involved again, the only viable alternative for banks are the AMS’s models. Models where the portals have already been snatched up by CoreLogic and others. WHATEVER model is ultimately used should be a ‘cost plus’ model with separate appraiser fees collected at the time the physical property inspection is performed-or check received by mail or efunds for vacant properties. The idea that appraisers must continue to act as financial ‘factors’ for banks and other intermediaries is preposterous. I posted this on my blog page, twitter, and other areas. I asked blogs to post as well. Sharing it gets word out. Over 500 views of the article on my blog page so far and 2 calls from news agencies. But wait!!! There is an appraiser shortage!!! The irony is that AMC’s have been singing that tune since 2009, as more and more appraisers refuse to work with them that they are finally feeling the pain and many are closing up shop and more lenders are switching to rotational panels, their days are numbered! But that’s true, there is an appraiser shortage. There is a severe shortage of qualified appraisers participating and employed at the majority of all distribution outlets, whether that be direct, amc, or otherwise. How can a non qualified person make such qualified decisions? There is a severe shortage of appraisers hired to sit in chairs for lead managers in distribution departments. People without real estate experience sit in these chairs more often than not and they’re severely underqualified, changing advocacy positions on a whim with no real understanding of ethic or any employment mandate to comply with appraisal ethic. Lost another top 10 client the other day, the distribution manager had no experience in real estate. Sure was good at pressuring appraisers and advocating on behalf of lenders interests, he was good at that, kept apparently on a quite short leash. There is no firewall between distribution without a qualified licensed person sitting at the assignment desk. Rather there is only additional pressure placed on the appraiser which the appraiser is effectively unable to counter or respond to. It’s like an old wives tale every time, the message as stated rarely gets through. The appraiser is expected to be as strong of an advocate regarding mb’s interests as the desk managers are, or they are replaced. There is no one to complain to, since they are not licensed and there is no clear regulatory framework for non amc companies. For amc’s, they just take a bigger cut and the senior appraiser, because they dare not hire more than one of those guys, spends all his time putting out fires and answering the biased requests of mb’s and the amc senior tech staff whom are essentially that appraisers boss anyways. The entire show would slow down significantly if each and every person whom manages appraisal distribution was required to hold an appraisers license. The problem is advocacy, the solution is licensing. The separation from loan production rules caused much more harm than they prevented. When the licensed appraiser dealt with the licensed mb directly, we never had these problems, not like this, not on this scale. Great examples Mark. I’d hazard a guess that in example 1 the borrower and lender also got some bottom of the barrel incompetent clown doing complex $1,000+ work for less than half. Any bets that AMC didn’t know the real C&R fee for that assignment? Mark, this is another great post. In previous posts, I’ve expressed my amazement on how many borrowers never ask about the appraisal fee. Without exaggeration, I think only “two” people asked last year. Either the lenders are very clever at disguising the fee breakdown or they take classes on how to upsell the AMC’s portion of the fee. While attempting to save their reputations, they instead blame appraisers for the past fiasco. On top of that, the lenders attempt to convince the borrower that AMC’s are necessary to monitor all of us horrible professional appraisers. One of the great points in your article was the fact that lenders and banks should be paying the additional fees to the AMC since THEY are responsible for this whole mess and are forced to contract their services. Those big banks were bailed out and never punished? At the same time, small and local mortgage companies (most of my clients) went out of business. I don’t talk about fees during the appraisal process because of the contracts. However, in everyday conversation, I will explain to anyone interested why the fees increased so dramatically. It’s very difficult to accomplish, but I’ve always been an advocate for appraisers working together to get things back on track. Like others have pointed out, if this article were introduced to reputable news organizations the outrage from people watching the local news would compel borrowers to ask specific questions about the high fees. I’m sticking with 60 minutes since they have already researched and looked into this years ago. They just never ran the story. Making this BS public will finally ensure transparency (not to mention public trust). like you said, nobody knows where their money is going! The AMC is the most organized scam in recent decades yet they keep on going untouched and the regulations are not being enforced. They are laughing at us. Some rules are made to be broken. I have never performed an appraisal without disclosing my fee at some point in the conversation. It’s a point they can not really come back to you about. The benefits of standard legal paper and stapling the order to the front page. This is me, this is the order, this is my fee, see, highlighted in yellow. Sue me, I was honest about my fee to the person whom paid my fee. I did try to control the appraisal fee when I refi’d through the local CU. Surprisingly they used the dreaded streetlinklillies services. The cg appraiser took that at 375 and my cost was 550. Although I tried for days and stalled out the process, demanding the appraiser get 500 even if I had to pay more, the mb and his manager whom I dealt with both told me they were absolutely powerless to effect the appraisers billing structure. That’s how it works these days, the amc’s have truly hijacked the work and through contractual terms no less. When lenders use third party assignment companies, on the ground practical level, they give up all control and basically prohibit consumer input, continuing these distortions of fair market pricing and unaccountable billing practices. Baggs you hit on a hugely critical issue. The pretense that we can ‘negotiate’ our fees. When a home owner is told that the MB or lender is powerless to affect a change in the fee it is either an outright lie, or a belief among lenders that TRID precludes them from affecting it. Either way IT AMOUNTS TO ANTI TRUST violation PRICE FIXING! It was odd. I volunteered to pay the appraiser more, but they refused to allow that to happen. If not for the amazing terms, 3.5k of closing costs covered, in house, zero principal addition and dropping off the 2nd chaffa 1st time piggy back, I would have never gone with it. When you’re in the consumer position though, you have to look out for number 1, and nobody else if that’s what it comes down to. We dropped that fha loan off at the daycare and saved over 60 large cash equivalent, chopped 11 years off of our initially scheduled payment plan. The benefits of not treating your home like an atm. That was why I became an appraiser, to know how to get a fair shake and steer clear of the aggressive salesmen. The rest is beer money, savings, and healthy organic eating. Living check to check is no way to live. I’m not in this industry for cash, I’m in it for the liberty. Nobody tells me what to do, never sacrifice the ideals, the way it should be. In Ron We Trust. I’m just happy I’m closer to the end of my career vs starting. I hate what this industry has turned into. Cross every T and dot every I or the report gets sent back. I just love getting 3-4 emails everyday asking how fast and how cheap can I accept an assignment. Then I just love the extra $10-$20 upload fee that comes at the end. Then you just love the twice a day update request by the AMC. And let’s not forget the 20 yr old underwriter requesting more comps. I can’t stand it anymore. Let’s strike. I’ve been on strike, where have you been? 1. What is your standard fee in my county? 2. Do you assign the majority of your orders through direct assignment at this standard fee, or do you micro manage most orders and play appraisers against each other in a never ending bidding war? 3. What is your standard fee the lender pays for the total appraisal services, before the fee is split? It’s that easy, qualify the client. If they don’t assign the majority of work at a fair and consistent fee, pass them over for a company whom does. You just qualify the client better, brush them off along the way, and treat the ones whom at least have a standard reliable minimum fee which is C&R or better, you prioritize them first and treat them better. If they can’t answer billing questions honestly, that’s a sign of other things to come, do not engage. And if they pass the 3 questions, and you have a heaven sent stroke of luck, someone at that assignment department will actually be qualified with an active appraisers license to run that department, but don’t hold your breath on that one. They have all sorts of clever sales tricks and slogans but nothing can substitute for a reliable client with a limited sized panel and reliable fees. Like they said in the old days, ‘all it takes is one good client’. They can save all the temporary raises, one time fee pump ups, and all of that grading nonsense. Just reject that and with a little effort, you’ll never have to answer a bid quote again. We are the service market, we set the service terms. If an appraiser can not outsell the unlicensed jr employee advocate trying to sell you on completing your own services for a fee paid to them… Nothing scares an amc manager more than their distribution staff starting to talk and act and ask critical fair dealing based questions like an ethical appraiser. If I need you, I’ll call you. If I want a new client I will pick up the phone and pick the one which works best for me. Old hat sales tactics. Have a firm set of criteria and do not depart from those engagement requirements. There is like 1,500 ml leads at your fingertips. Excuse limit is currently set to zero. Be wary of unlicensed persons in distribution, the longer an unlicensed person has sat at those positions, the more dangerous they become. What you say is right. It’s up to us to weed out the trash and bottom feeders. They will always prey on the weak appraisers willing to offer their services for 50 cents on the dollar. I love to tell these AMC’s that they are on my unapproved list of clients and to take my name off the active list immediately. I tell whoever inquires about my services what my net fee is. If you charge an upload fee, then that has to be added on to the total fee. Luckily, I have about 4 good, steady, normal old time clients that I don’t have to go through this with. This is regarding that lousy 20% AMC group that I would love to blow up. Collusion and racketeering through and through. The amc drives down the fee, pockets so much. They turn and develop tools to sell appraisers to assist in both outsourcing and time saving efforts which result in generic less reliable reporting trends. Then they substitute the appraiser with their own proprietary tools, thereby circumventing nearly the entire rule set for valuation surety, kicking back a portion to maintain the access. The icing on the cake are the pawns on the board whom become virtual kings, bragging about volume and outsourcing, the preferred appraisers who make the big bucks! It’s all buried in QE anyways, and with rampant inflation here, nobody will ever unpack the whole thing, at least not before a sizeable chunk of those notes grind back through the repurchase pipeline. It’s like the perfect crime. It’s important to not let yourself be tricked, to buy the hype that outsourcing is good and volume is necessary. The root cause of all of this, improperly co mingled fees of course. Lenders would not pay for the middle management service in the absence of co mingled fees. Nobody would work this hard to drive down the appraisal fee to save borrowers a few hundred, those guys are already 3.5k in costs on every single deal, the few hundred only matters to the amway representatives, er, I meant the amc’s. The program has been so wildly successful that now direct lenders are raking off the fee to fund their distribution operations. It was all so much simpler when the mortgage broker distributed the orders. If only they would have used a rotational lists. The wasted man hours which have gone into ‘distribution tech’ and clever time saving appraisal tools is truly astounding. Homeowners really don’t care about whether or not appraiser is being paid $249 or $500. The GSEs really don’t care that AMCs choose the fastest and cheapest appraiser for the job. The mortgage industry does not care if the appraiser with 35 years of experience and expertise in complex property appraisals is selected for a complex assignment over someone less experienced. Unfortunately, with the exception of portfolio lenders with skin in the game, the mortgage end users care about one thing and one thing only – that the value is sufficient to make a loan on the property. This system is designed to give the appearance of appraiser competency via the state licensing/certification process. All parties involved in the process are well aware of the shortcomings of the AMC model. In fact GSEs and mortgage industry designed it. I would go so far as to say that the low fees and quick turn times criteria was designed to force appraisers to have to do more assignments in a week than is reasonably possible just to feed their families. There are many, many appraisers completing multiple reports a day which is impossible if you follow the appraisal process. Finding appraisers who don’t spend too much time properly developing an appraisal but who deliver on the bottom line is what the AMC system is designed to do. To be fair there are some banks and lenders who do seek out professional, ethical, and competent appraisers and pay a fair fee but they are not the norm in the overall scheme of things in this AMC ecosystem. The system is broken but the parties responsible don’t care. They only care about their bottom line. A near perfect summary Tom. The old speedbump argument eh? Well, that’s why I say there are not enough responsible parties, and if every single person in distribution was required to have an appraisers license, the landscape would be so much greener. Cheers. I disagree. I’ve come across many who have have shown their displeasure knowing they over paid for an appraisal could have saved money. Many people who go to refinance only to not be able to who are now out $600 instead of $400. Most consumers don’t care about about the cheapest appraiser cause they have no clue what is going on and they put their trust in the lender to do what’s right by them. The lenders don’t care cause it saves money for them. It’s all false narrative being spewed out by everyone and not the truth. Bingo, we have a winner! That sums it up perfectly, NOW what do we do?????? Put a new dialogue in your conversational repertoire. When are you going to hire a qualified licensed appraiser to manage the appraisal distribution department? Isn’t it just an obvious regulatory shortcoming that amc’s have to hire an appraiser but ‘direct’ does not?